Our Music Department aims to find and release in all students the gift of music and to encourage and develop it in instrumental playing, singing or through the curriculum. Co-curricular musical opportunities are varied at St Mary’s and include everything from ensembles to the much-admired school band. The Chapel Choir, which is at the heart of the liturgical life of the school, frequently travels abroad and the girls are regularly invited to perform in places such as Vienna, Rome, Venice and Budapest. A wide range of instruments are taught by our permanent and visiting staff, and the talents of our enthusiastic and skilled musicians are on display at regular lunchtime concerts, House concerts, seasonal programmes and much-enjoyed ‘Live Lounge’ events for Sixth Formers. 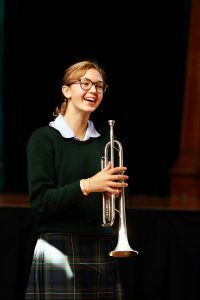 In addition to performances by our own talent, we regularly welcome visiting musicians who perform public concerts at the school which are enjoyed by pupils, and the public. We have an excellent venue for live music performances in the Campion Hall. Please see here for more information on music scholarships.